The right time to start your own business or have the NGO’s business idea by using our Crowdfunding Android Application, because the crowdfunding empowers you to be an entrepreneur by helping or donating the amount. This crowdfunding application is unique from other crowd raising app. 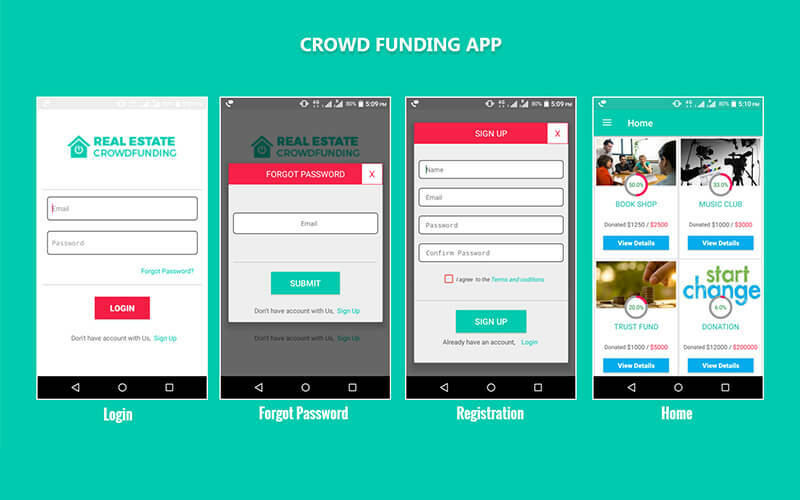 The scope of this crowdfunding app is high on demand among the small business entrepreneurs to get financial support from the investors to form their own network for their business by doing the financing the projectsor fundraising to the particular projects. This app is designed and customized with deep analysis on the crowdfunding analysis with the user-friendly, mobile-friendly customization. The Kickstarter android app is unique with multi-functionality features with the list of categories not only for the fund’s projects, where the investors can also invest their amount in multi-category listings like the small business, social entrepreneurs, tech startups, films & entertainments and others etc. The users or investors can register their account with the valid mail id and password, and then they can sign in to the account from their user place and can see listings of project categories for the crowdfunding with easy pop-out display which shows percentage level of the fundraises. In this Kickstarter app for Android,the investors can donate their funds by seeing the details and descriptions about the projects which include project category, company name, location, starting and ending date of the crowdfunding,minimum deposit, and target investments etc. Then they can click down the invest button, where the required details are to be filled with the amount which is greater than the minimum deposit. The investors can manage their profile by updating the profile information. The Crowdfunding Android Application has the admin side where the investor’s management, project management, adding and removing the listings categories, the project post request is approved by the admin by submitting valid proofs and license about the company or projects. It is safe and secure to invest the amount on our Kickstarter android app with easy and flexible for the investors. It is made simple for the fundraise by creating the profile, explain about projects, set the fundraising goals and share with the public. The App is customized with analysis on the high mobile speed insights to load the page as fast as possible with the latest fundraising features and integration of the NGO’s business functionality are included in our Kickstarter app for Android with the better reusability of the app andreli ability. Investments Management, Clear listing with details, Project Status, Profile management, Project management.